Squash, which has this week made its debut as a Showcase Sport at the Youth Olympic Games with week-long action taking place in a state-of-the-art glass court situated at Technopolis park, has captured the minds of thousands of local school children in Buenos Aires who have experienced the sport for the first time in their lives. More than 400 children each day have been introduced to the game on a miniature outdoor demonstration court, allowing them to hold a squash racket and hit a squash ball for the very first time. Those children, along with hundreds more, have then watched some of the world’s best young players showcase the sport on an innovative glass court with an interactive front wall. 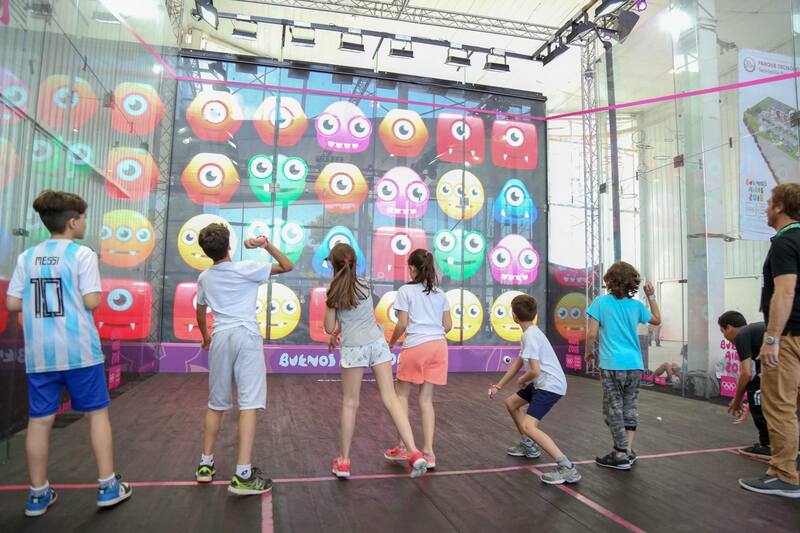 The interactive wall, developed by German company interactiveSquash in partnership with the Professional Squash Association and World Squash Federation, has transformed the court into a colourful and engaging playground that has delighted and awed fans of all ages. Throughout the week, the court has come alive with player tracking and reactive displays showing the location of ball impacts on the wall – while hundreds of school children have had the opportunity to step onto the court for the first time in their lives and experience the interactive gaming modules first hand. Through a series of introductory activities on both courts, aimed at encouraging children to get active and become acquainted with being on a squash court, a new generation of Argentinian children have been inspired to get involved in sport. These youngsters are given the opportunity to develop their love affair with squash at local centres as part of the integrated programme. “To see so many children becoming involved with squash for the first time in their lives this week, and to have so much fun doing so, has been a huge success for us and we hope it will have encouraged a new generation of future champions in Argentina,” said World Squash President Jacques Fontaine. Argentinian Squash Federation President Juan Pablo Garcia said: “The activation programme, both on the miniature outdoor court and on the stunning glass-court, has been a huge success and we hope that squash’s participation here in Buenos Aires will have a lasting legacy for the community here and for the sport worldwide. Markos Kern, founder of interactiveSquash, added: “This is squash plus gaming. We are bringing fun back to sport and we are already seeing that, as a result, squash is becoming more popular and more people are being introduced to the sport. “This system turns the actual sport of squash into an interactive experience. It’s fitness, sport, fun and technology all coming together to encourage activity and put fun into activity.